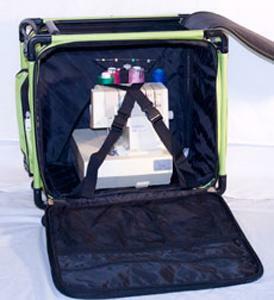 20" Serger Case On Wheels is designed for road vehicle transport. Not recommended for airline check-in. This sturdy bag is good for your serger, laptop, thread Treasure Chest, and sewing supplies, etc. The case fits most serger machines in 20" cubic inches space.